Steamboat stalls spend effort getting temperatures just right — using a modified vaccuum cleaner if necessary. The ingredients are simple; it’s the broth that’s the secret. While you’ll also usually be served rice and free top-ups of soup, a fish-head steamboat may not be sufficient for a few people. 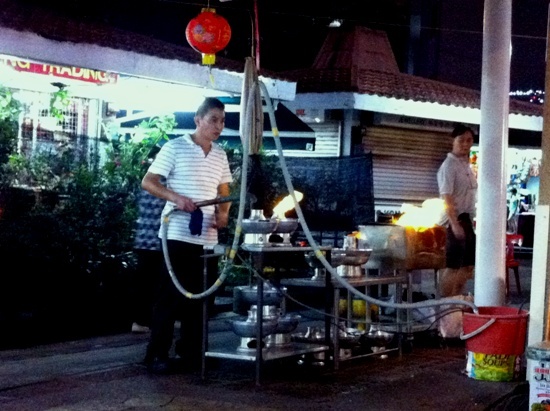 Groups usually order a variety of zi char dishes to complete their meal, so steamboat stalls are typically located near zi char stalls, or they serve up some zi char as well, although just popular classics such as har cheong gai (fried chicken coated with prawn paste) and sambal kangkong (river spinach fried in a spicy sauce with dried shrimp). 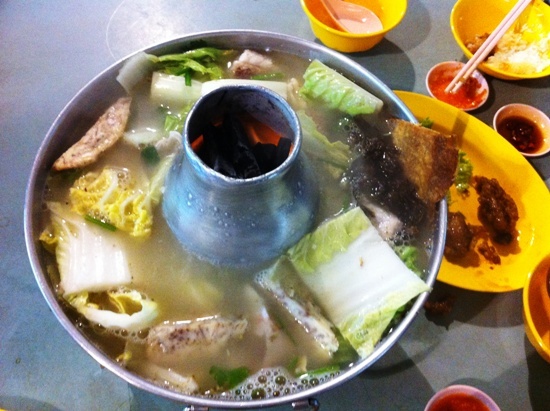 Here are some suggested places to try fish-head steamboat in Singapore. Expect to pay S$20-$35 for the steamboat, excluding rice and additional zi char dishes, which are around $8-$20 per dish). Whampoa Xin Heng Feng Fish-head Steamboat: Whampoa Market, 91 Whampoa Drive. Open Wed-Mon 17:00-21:30. Tian Wai Tian Fish-head Steamboat: 1382 Serangoon Road. Open daily 17:30-23:00. Hai Chang Fish-head Steamboat: 137A Tampines Street 11. Open Wed-Mon 17:00-21:45. You can also find steamboat in the various coffeeshops that line North Bridge Road.